Ayrex is a relatively new binary options company that only opened in 2014. The company is operated by Advanced Binary Technologies Ltd and is based in St Kitts. They have an innovative approach to the industry, which includes an easy-to-use demo account that does not require the user to stay with the Ayrex platform, or even provide a deposit to open in the first place. They also aim to provide a smooth-running service with minimal downtime so that all transactions can be made securely. Ayrex offers customers fast payouts, great promotions and an open trader platform. 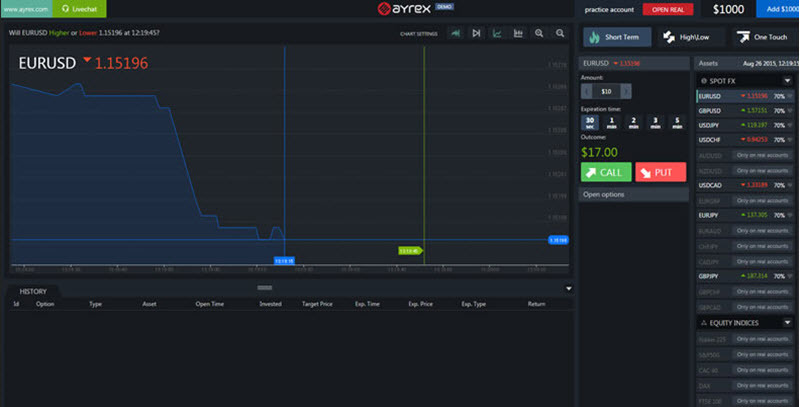 Ayrex’s trading platform is laid out in a clear and functional manner, clearly displaying all the necessary data that is required by the traders. It is similar to many other brokers in this way and has a user-friendly layout that has garnered very little criticism from its clients. There are simple buttons to use that can toggle between trading quotes and change the display type to suit the individual’s need. Prices are displayed in graph format with clear areas for the client to adjust trade values and expiry times. Withdrawals can take around three days to process with a minimum withdrawal amount of £5. There is the option to make one free withdrawal in any given calendar month, otherwise each withdrawal will be subject to a commission based on the fees that come with that particular payment transaction. Deposits occur faster and can be made through a variety of different providers such as Neteller, Skrill and Visa. At the time of the deposit, traders can choose the bonus they wish, which can be between 10% to 30%. This bonus deposit will have terms attached, which traders need to read through carefully. For the most part, Ayrex is relatively complaint free. However, there is always some concern over the payout rates as they are different to those displayed on the demo account. This does seem to now have been rectified. There are occasional delays with withdrawals, but most are handled successfully once verification is provided. It is recommended that users don’t wait until withdrawal times to verify their account, but do so before. Ayrex has a round-the-clock team to answer any queries and they can be reached by phone, email or even a live chat function which offers prompt and helpful responses. Ayrex provides a good all-round service, including a well thought out trading platform that provides all the pertinent information without appearing too busy and complicated. They also offer a decent mobile app and as of 2016 this app was fully updated and compatible with both Android and iOS systems. The app is a mirror of the website and offers the same range of options, allowing users to make their transactions on the go. The biggest draw here though is their demo account. With no need to sign up, the demo account is an excellent way for many new users to get the feel for the platform without the pressure of having to spend any money.